Over the last few weeks, I’ve seen more and more evidence of God at work in many different places in raising up leaders to champion the cause of mental health ministry in the church. It seems like articles are appearing more and more frequently calling attention to the needs of persons with mental illness at church, including this post on making the church a safe place for persons with mental illness, an excellent piece written by Brad Hambrick for the ERLC describing five ways the church can help someone with mental illness and this interview of Kay Warren by Ed Stetzer on suicide, mental illness and the church featured by Christianity Today. Matt Stanford has come out with an updated and revised version of Grace for the Afflicted, the book he authored to educate Christians about mental illness from both biblical and scientific perspectives. Matt writes thoughtfully from his experience gained as an academic neuropsychologist at Baylor University and offers encouragement and comfort to fellow Christians who have been assumed their mental illness is a result of personal sin or insufficient faith. 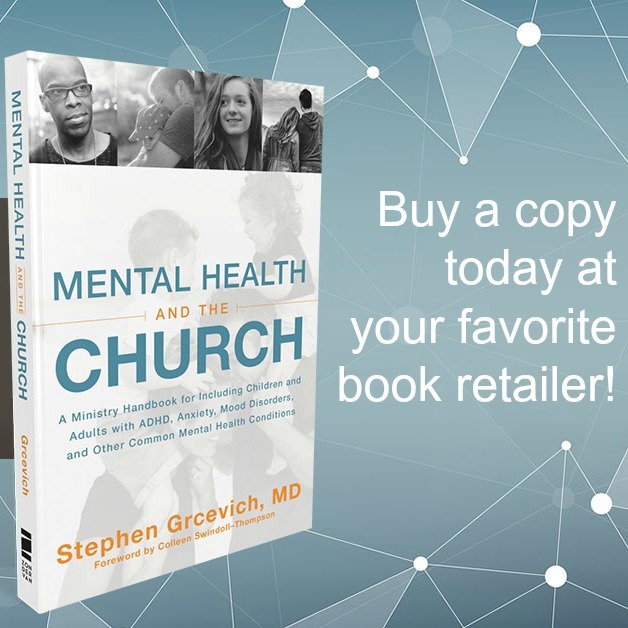 The updated version includes eight new chapters, including chapters on bipolar disorder, trauma and stressor-related disorders, traumatic brain injury and mental illness and the church. Saddleback Church is putting on Reach this week, a three-day training event for churches interested in launching an identified mental health ministry. Their training seeks to a provide a theological framework for mental health ministry, develop a paradigm for care, understand how to deliver practical and effective levels of ministry for any size church, learn about tools and strategies for starting a mental health ministry, and much more. Earlier this month, I had the pleasure of participating in the Mental Health, Children, Youth and the Church Conference, sponsored by Fresh Hope for Mental Health at Nebraska Christian College. Fresh Hope was started by Brad Hoefs. Brad was serving as senior pastor of one of the largest Missouri Synod Lutheran churches in the U.S. in the mid 1990s when he lost his job in the aftermath of an episode of bipolar disorder, a condition that runs in his family. Amy Simpson wrote an excellent article describing the circumstances that led to Brad being called to pastor a church started by a core group of families impacted by mental illness and the need that led him to launch Fresh Hope. Fresh Hope is an international network of Christian support groups for those who have a mental health diagnosis and for their loved ones. They seek to empower individuals with a mental health challenge, along with their loved ones, to live a full and rich faith-filled life in spite of a mental health challenge. Fresh Hope groups are now hosted by churches in over 20 states, along with groups in Canada, England, Guam and Australia, along with online groups. They’ve recently launched Fresh Hope for Living Free, a support group model for persons with mental illness who are incarcerated, and Fresh Hope for Teens for adolescents with mental health challenges and their friends. Brad also hosts a very popular podcast on mental health-related topics. Brad and his team have graciously posted the entire video of their recent conference for the benefit of church leaders and fellow Christians everywhere. My presentation on Key Ministry’s model for welcoming children and families impacted by mental illness into the church begins at around the 15:00 mark of the video. Dr. Brian Lubberstedt‘s overview of common presentations of childhood mental illness begins at around the 2:00 mark. I’d strongly encourage readers to check out Colleen Swindoll-Thompson‘s talk beginning at around the 4:15 mark in the video. Colleen shared an remarkable witness in which she discussed the ways in which her family has been impacted by trauma and mental illness. Her willingness to be so open and authentic about her family’s experience represents an incredible gift to the church and a powerful response to the historic stigma surrounding mental illness and the church. Would you like to be part of the rising tide of support in the church for persons with mental illness and their families? Pray for our team and for all of the outstanding ministries doing work in this arena. Ask God how he might use you to minister with persons affected by mental illness in your sphere of influence. Check out the resources listed above. Share resources that others may not be aware of in the comments section below. Become an advocate for mental health ministry in your church.